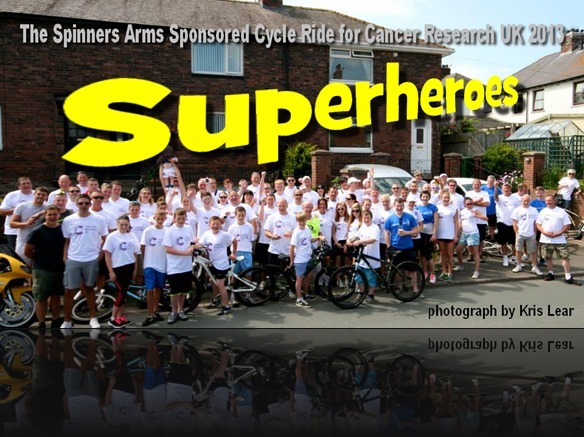 The date was Saturday 13th of July 2013 and it was time for the sixth annual Spinners Arms Sponsored Cycle Ride in aid of Cancer Research UK. This is the third time I’ve taken part and it was another hard one (you can read about the other hard one here http://www.wizardmarra.com/from-pedals-to-podcast/) It’s important to me to do this ride even though my own health isn’t brilliant right now. I lost both my Mum and Dad to Cancer, my sister in law too.I also had a Prostate Cancer scare a couple of years back and that still sits at the back of mind that it might come back, and right now my Mother in law, Anne is living with it and it’s just a matter of time. As I write this I have heard that a close friend of some of the riders has lost his battle today. Someone said to me that they would donate if I was doing something for a charity that doesn’t experiment on animals. I don’t know if Cancer research do, I’ve never tried to find out Cancer scares me too much, I know the heartache and horror of watching people die from this hideous thing. All I have to say of the animal experimentation aspect is. If you had a loved one suffering from Cancer, would you refuse them treatment because it had been derived from research on animals? 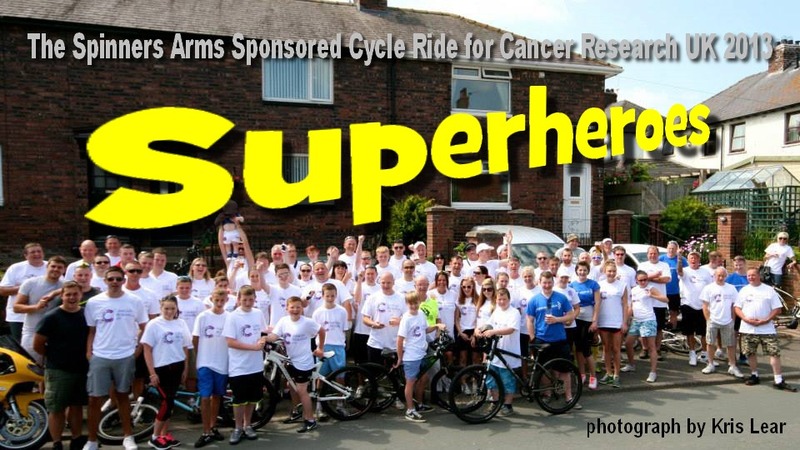 Fortunately as we were getting our number tags laminated and pinned on to our new Cancer Research UK T Shirts a gentleman named Gary Braddock was going round all the bikes pumping up tires on those that needed it and this sums up the whole bike ride. It’s a little community on it’s own with everyone supporting everyone else. There are no egos as we all know the sobering (there’s irony in that word) reasons for doing it and we all know it can be a hard ride. First time riders have no idea, anyone who hasn’t done it has no idea. Twenty Five miles isn’t a great distance, but it isn’t just a la’al skip either and coupled with our weather be it thunderstorms or heat it makes parts of it hard work indeed. Lots of it is really good though gliding through fantastic countryside with no deadline. Bliss. Karen was riding for the first time, little did she know what was to come. This year 85 riders took part the biggest number yet. We set off at Noon and started sailing out of Cummersdale down the affectionately named “Wibbley Hill” and I’d not been riding five minutes when my silently flying freewheeling sweet spot began to drag and a vague miserably quiet farting sound issued from my front tire as I slowly ground to a halt. I blame the unlucky happenstance of my tire possibly coming into contact with an errant thorn that had been knocked from it’s branch by a passing wagon, perhaps on route to the old Stead McAlpin factory behind which I now stood, deflated in more than one sense of the word. 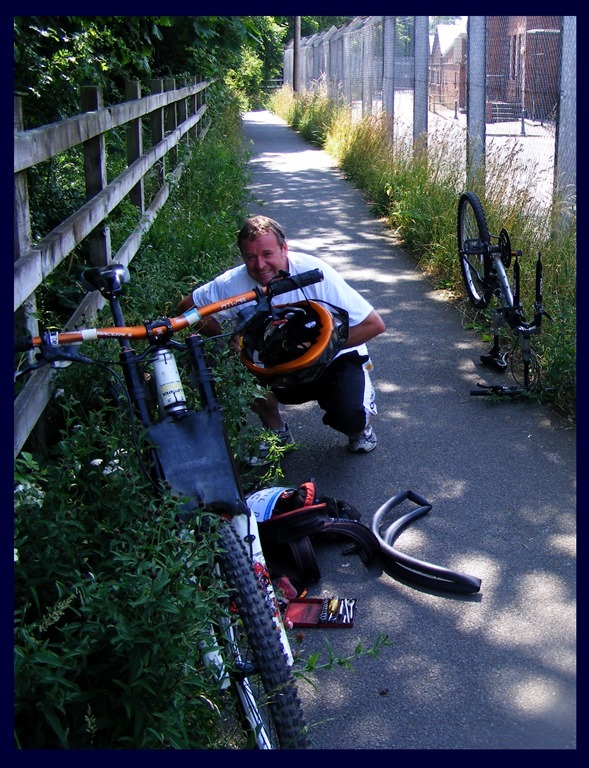 But I was saved by the aforementioned Gary Braddock who was bringing up the rear with a bag of tools, spare inner tubes and anything that may be required by any of us that were in trouble. The man is a STAR, within another five minutes he’d fixed the bike and Gary, Karen and I were off again with lost time to make up. OK! I know I said there was no deadline but part of the pleasure of the day is to ride with everybody else and we were well behind everybody. By the time we reached the Stag at Low Crosby (named after Bings deep bass singing younger brother), the leg between Cummersdale and Low Crosby around 6 miles is the furthest stretch in one go, so by then Karen was starting to understand what it’s like to be on a bicycle for the first time in 5 years, the heat was on, I was desperate for water and the only people left were the Marshalls patiently waiting for us. A sit, a sandwich and a bottle of water and we were off to the next stop The Corby Bridge Inn. I love this section of the ride it takes you past Corby Castle and through a part of Cumbria that to me seems more quintessentially English as opposed to Cumbrian. Theres something about the way the fields are, the fact that there’s a posh golf course and the hedges are always very neatly trimmed I half expect to see Alastair Sim drive past in a Morris Traveller. All this post war cinematic pastoral idyll is but a ruse though to lull you into the belief that all is nice and sweet before you hit the last three hundred yards before the Corby Bridge is The First Hill Of PAIN. God it’s steep and I am proud to say I’ve never ridden all the way up (or did I last year, if it did it was so horrible an experience I’ve forgotten it.). Happily though we’d caught up with the main body of riders and you could feel the love. Karen and I didn’t drink on the way round but a lot of people did, but it was ……very very hot at the time. By now Karen was becoming saddle sore and the first part of the next leg takes us over the Wetheral Viaduct and the most amazing view of the River Eden. The viaduct footpath is floored with wooden planks set apart at intervals of about an inch and a half apart, the perfect spacing in fact to effect upon a bicycle a torturous vibration that at best not a pleasant feeling. When one is suffering from burgeoning agonies of the arse ,your teeth begin to melt in pain as the machine gunned vibrations sting like a thousand darts spearing towards your colon. 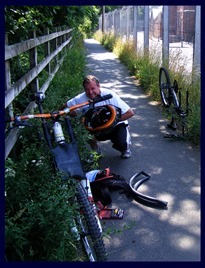 No rest once your over that bridge as you then have to carry your bike over the railway bridge. I’d taken mine over and gone back to take Karen’s across but as I’d gone but a few steps a helpful Marshall took it over for us. At the short hill that we needed to go up and set off toward Cumwhinton more repairs for Gary, this time on Phil Taylors fixing snapped deraillieour, de rallyer, derailliar fixing the fancy gears on his bike. The only other incidents being I nearby led Karen the wrong way as I’d forgotten which way to turn and getting encouragement from a nice lady just outside Cumwhinton before arriving at The Lowther Arms. A rest her to steel ourselves for the next section between Cumwhinton and Durdar. Only four miles, but the hardest four of the entire ride. It’s all right leaving Cumwhinton, some nice cycling mainly downhill in a bucolic landscape then you meet the Golden Fleece roundabout and the junction from the A6 to the M6. 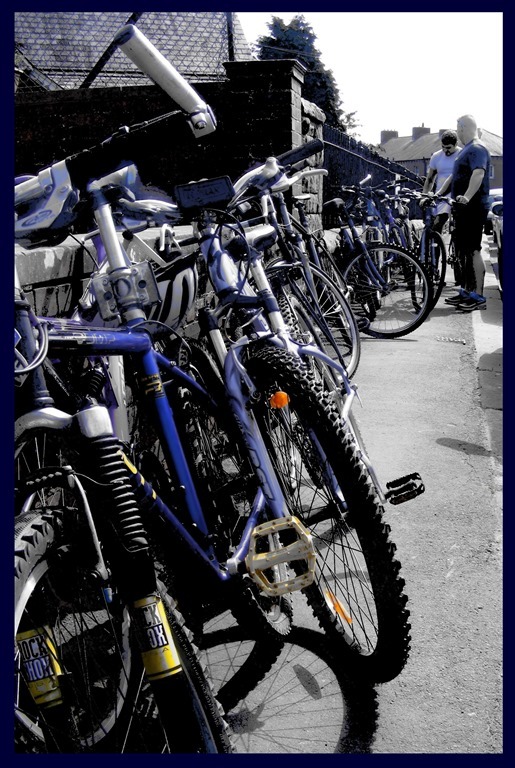 With diligence and common sense this is easily crossed, though for the younger riders or less confident the ever faithful Marshalls are there to transport them across. After that though and a deceptively good curve down hill you meet The Second and Mightiest Hill Of PAIN a long drag of incline that you only have a brief respite from once you crest the hill until your on another stretch about miles in all. Karen and I dismounted, I was seriously starting to suffer now. I’ve got a bladder/kidney infection that’s somehow linked to my diverticular disease and it won’t bloody shift making me feel shite most of the time. I can psychologically ignore it when I really have to but sometimes it won’t allow me to this part of the route was a battle for me. Karen too was really jaded by now and was starting to consider walking the rest of the way as you was at the stage were sitting on the bike was like visiting the dentist as a child and I mean the proper old school hairy armed ex military dentist whose idea of an anaesthetic was to whistle loudly when using needles and drills (at once). Coupled with the full on head wind blowing at you it made this the worst section right at the time when you really don’t need it. Finally reaching The Black Lion at Durdar is rapture. Durdar to Dalston, Karen is not a happy bunny and the idea of walking the final miles is becoming a better idea to her. She needs lots of moral support and encouragement that although the bike is uncomfortable in the long run walking eight miles is this heat would become a far worse thing to do. We’d broken the back of the cycle ride and before she knew it we would be enjoying a pint in the Spinners. we were soon at The Bridge Inn at Dalston. After a brief rest at The Bridge we set off for the final push, the actual final stages are from the Bridge to the Blue Bell Inn less than a mile, and from then on back along the cycle path to Cummersdale. But we needed to get this finished and back to the Spinners. Poor Karen gritted her teeth and was grim and silent on that final three miles. I was uncomfortable too and feeling really ill by this point but there is something about the cycle path that I find really soothing as you ride along a smooth well laid path, out of sight and sound of cars. In places the Caldew at your side (and very inviting that cool water looked too) it’s the best part of the ride. Until you reach the bottom of Wibbley Hill which requires a short slog to the top and then back on the bikes to ride around the corner and back to the Spinners, home it’s over and GET ME A PINT! 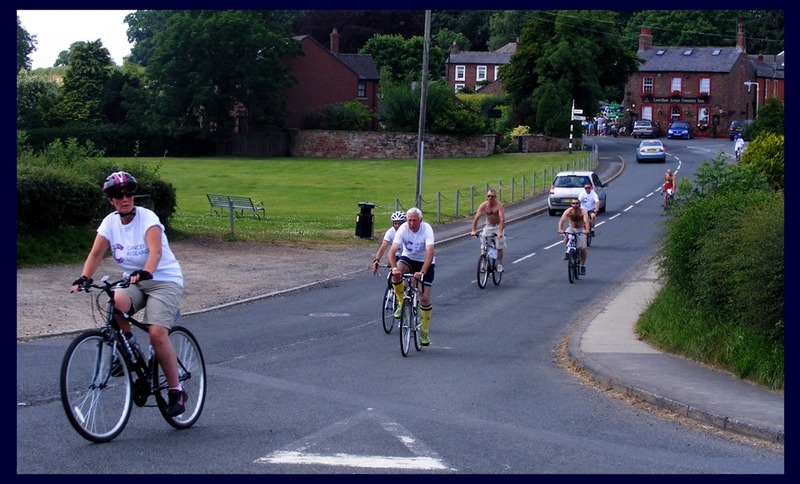 Thanks to all the hard work Alison and Alain Davis put into this event every year, hopefully when all the cash is counted the grand total raised by the Spinners Bike Ride over the years will have reached £30,000. and finally massive thanks to everyone who sponsored me, especially to the anonymous donor who gave £100. WELL, MAYBE ONE MORE BEFORE I GO. This entry was posted in Life & Living and tagged charity, fundraising, spinners arms by Alan Whittaker. Bookmark the permalink.